It seems like I was just here a few months ago (I was), but I found myself in Washington DC once again. While in the city, the first place I ate was a restaurant called Austin Grill near the National Mall. Over the next couple days while in the area, I passed by a couple more Austin Grills. According to their website, they have four locations in the DC area. Austin Grill served Tex-Mex food. The meal started with a basket of chips and salsa. I did enjoy the salsa. It had a lot more flavor than the standard Mexican restaurant salsa. It had a nice kick to it, as well as having a nice cilantro flavor. I had the Double Stuffed Chorizo Tacos. The double stuffed aspect of the tacos was interesting. Rather than just having the taco fillings inside the tortilla, they melted cheese between two tortillas and used this mini quesadilla as the taco shell. The inside of the tacos were filled with chorizo, grilled onions and peppers, and more cheese. The chorizo had a nice, spicy flavor and melded well with the cheesy tortillas. Refried beans, rice, lettuce, and salsa were served on the side. I enjoyed my food. Everything I ate at Austin Grill was very flavorful and was very filling. I'd come back here again. Time for another road trip meal along I-95. It was time to have dinner and I found myself getting off an exit in Wilson, NC. I bypassed all of the normal big chains that I'd heard of here and decided on a restaurant in a strip mall called Maid-Rite Diner. Apparently Maid-Rite is a chain with locations mostly in the midwest. I apparently came across the one and only location in North Carolina. I tried their turkey sandwich, served on a ciabatta bun with lettuce, tomato, and mayo. I was surprised to see actual turkey on the sandwich rather than standard deli meat. This was a good and bad thing at the same time. It showed that Maid-Rite was using better meat than other places that serve processed deli meat, but the turkey on this sandwich was served cold. There's something about turkey like this that rubs me the wrong way if it's chilled. If it seems like real meat, I want it warm. Beside this fact, the sandwich was good enough. Fries and a drink were also included with the meal. The sandwich from Maid-Rite was better than a sandwich from the surrounding fast food places, but wasn't outstanding enough to seek out again on a future road trip. I was in the middle of a road trip heading north along I-95 when lunch time rolled around. We stopped to get gas in the town of Darien, GA and hoped there would be some food at the exit as well. The normal selection of fast food places were abundant here, but then a restaurant called Bubba's Southern Cafeteria advertising bar-b-que and award winning Brunswick stew caught my eye. We entered the restaurant, and it really was set up cafeteria style. There was no menu. There was just a cafeteria line where you choose a meat and your sides. The three meat selections that were available were fried chicken, fried fish, or fried shrimp. There really wasn't any of the mentioned barbecue being served, but we ate there anyway. The Brunswick stew wasn't being served on the day I visited either. I decided to try the fried fish. I was given three pieces of fish that was lightly fried. The fish still had skin, bones, and fins which would probably be a turnoff to some people. I was fine with picking around the inedible parts. I'm not sure what type of fish it was, nor did I ask, but it was pretty tasty. For my sides, I choose the collards, macaroni & cheese, and mashed potatoes. The collards were the best of the three sides that I tried. A roll and sweet tea were also included with my meal. 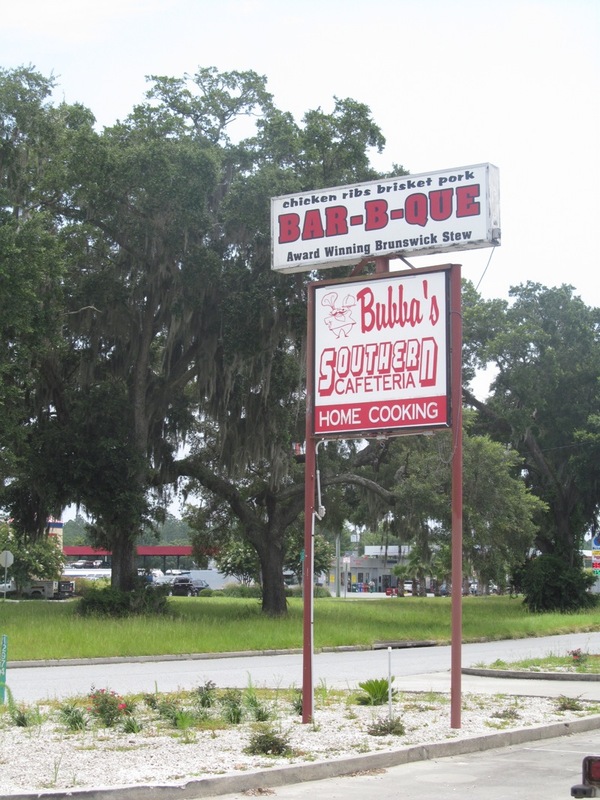 Overall, I enjoyed my meal at Bubba's Southern Cafeteria. It wasn't exactly the barbecue that I was expecting when I went into the restaurant, but I still liked it. There ended up being a whole lot of food served for the price and the people working here were super friendly. I tried a restaurant serving pizza in MetroWest called Pie-Fection. This place is somewhat fast food where you order at a counter and wait for your food to be delivered. All the pizza toppings are located behind glass and apparently this place is supposed to work like a Subway where you tell your pizza maker exactly what you want on your pie as it's being made. When I walked in, I was handed a menu with lots of set topping combinations. 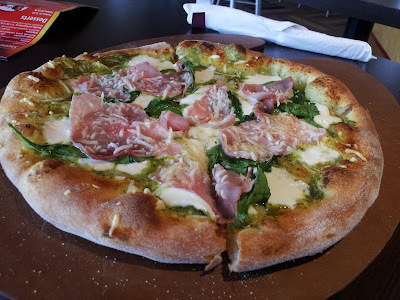 Interestingly, there were lots of Brazilian inspired pizzas on the menu, but I went with what they called the Italian. I visited the Orange City Food Truck Bazaar. 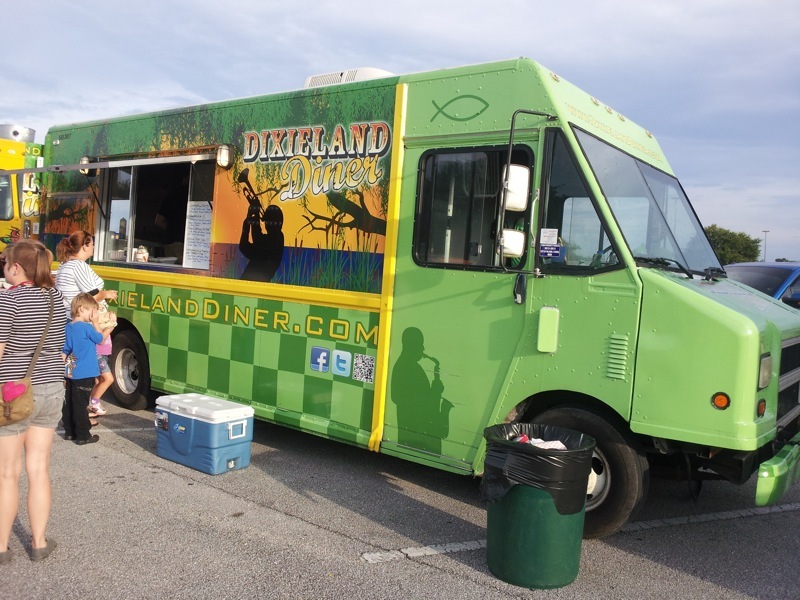 I tried a truck serving Cajun food that I had never eaten at before called Dixieland Diner. I ordered the Shrimp & Grits. 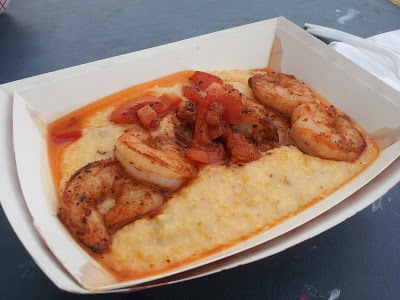 This bowl of cheese grits was topped with chopped tomatoes and several large shrimp. The shrimp had a nice spicy seasoning and the grits were cheesy. Overall, I found these to be very tasty. The first response from someone I was here with was a look of disbelief and the comment "you paid $9 for that!?" The portion did appear to be on the small side, but I guess the bowl was bigger than it looked because the meal filled me up. I liked my shrimp & grits. I'd try Dixieland Diner again, although think I'll try something else here the next time I visit for some variety. 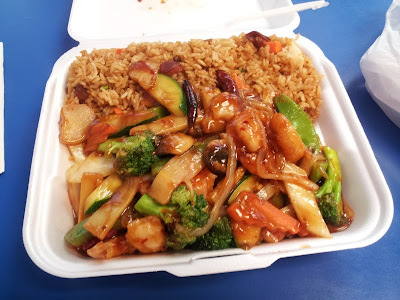 I ate lunch at China Lee in the MetroWest area of Orlando. This Chinese takeout restaurant is hidden away on the back side of a strip mall located in the parking lot of a Walmart. Typical of most restaurants like this, there were only a few tables for dining in with most of their business being to-go. My meal here consisted of the Szechuan shrimp combination. On a drive home from south Florida, I stopped into the Palm Beach Gardens Mall located just off I-95 to stretch my legs for a few minutes. While there, I ventured into the food court and got lunch from a Middle Eastern restaurant called Ollo Fresh. I ordered a gyro sandwich. They offered a choice of lamb or chicken gyro inside the sandwich and I choose the lamb. The pita was topped with lettuce, tomato, onion, and lots of tzatziki. The lamb had nice flavor, as did the tzatziki. 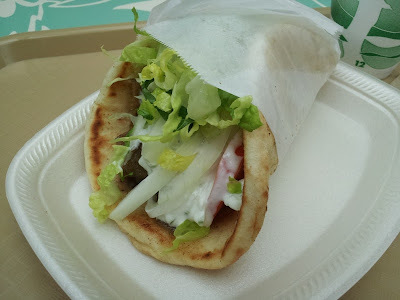 Overall, this was very typical of what mall food court Middle Eastern restaurants serve, but I was happy with my gyro regardless. I had dinner at the new Terra Mia in Longwood. This is the same Terra Mia that has a location in Lake Mary and was formerly located in a strip mall right around the corner until they moved here. This new Longwood location now serves pizza, unlike their store around the corner. 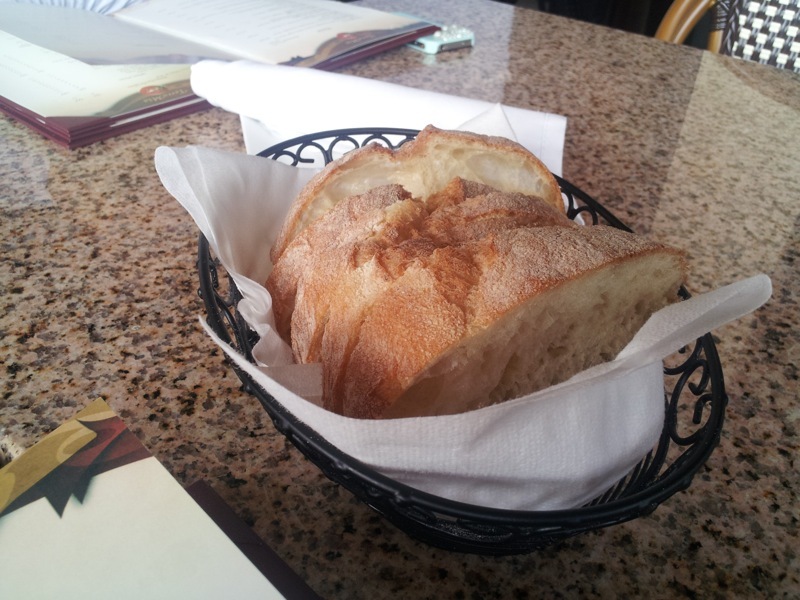 Upon arriving, our meal started out with some good bread with nice crust. I ordered the Deliziosa pizza. 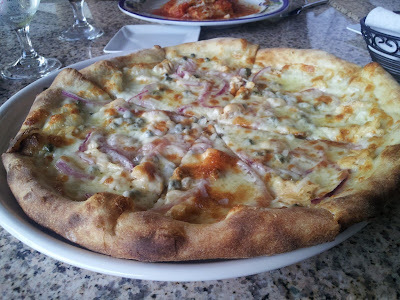 The pie was topped with salmon, mozzarella, capers, and onions. I've tried other seafood on pizzas in the past, but I think this may have been my first time having salmon on a pizza. I did enjoy it, although they weren't very generous with actual amount of salmon on the pie. The combination of capers and onions went well with the salmon. The crust was nice and crispy. I ordered the Sage Fried Chicken & Bacon Waffle Tower on my second visit to the restaurant. This was a huge serving of chicken & waffles. The waffles had bacon cooked into the batter which was unique. I don't think I've ever had waffles containing bacon in the past. The tower of fried chicken was very tasty. The batter had a really nice flavor. I finished my whole breakfast here. Chicken & waffles was much larger and I made it about half way through. This chicken & waffles was much better than what I've had at places that specialize in chicken & waffles, so that's a good thing! I enjoyed my food on both visits and I'd return to Hash House A Go Go!